The candy store is good business. It has a constant flow of customers and highly demanded products. It is an especially good business idea if you have your own bakery or a sweets shop. Yet, in modern times you have to be online if you want to boost your profits and increase client base. This is why you need a Chocotch OpenCart theme developed specially for candy stores and pastries. It is a professionally developed theme that includes full Shopify e-commerce pack. It has a cart and wishlist for comfortable shopping and currency options for customers from other regions and tourists. You can sell chocolate and gifts made from chocolate too. It has a creative design and allows you to present products in the best possible way. 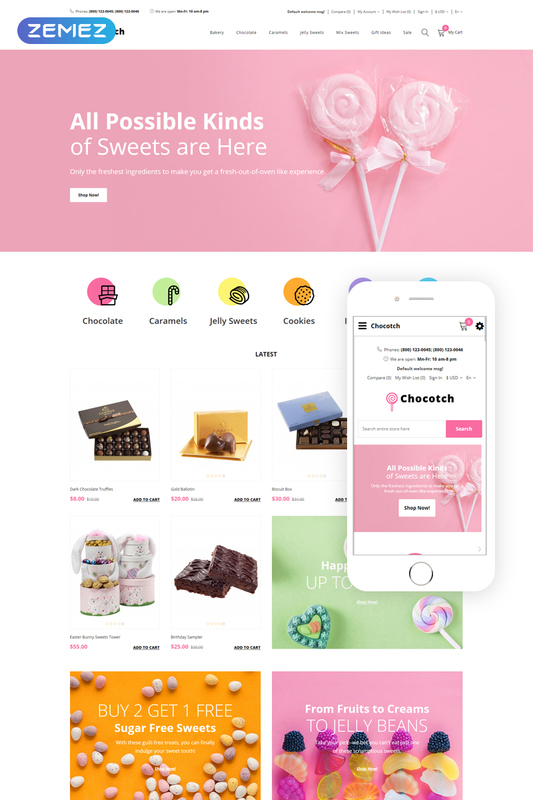 Chocotch is a great candy store theme and you can sell any type of sweets with an online store developed with Chocotch.